Roses are beautiful flowers. They are beautiful in whatever form they are in. Whether Roses are real, synthetic, or drawn and they still will not lose their beauty. 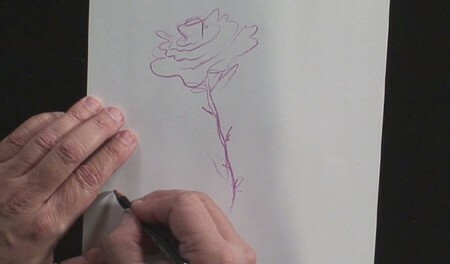 Here are some dimple steps to help you draw a rose. Follow the instructions below. Read on for more information. Choose a resource from a sketchbook page with roses on it. Draw the swirls where they need to be as they appear. Copy the swirls to the best of your artistic ability. The shape and size matters so take that into consideration. Use black pencil first then add the color as you move along with the picture. When you have complete the rosebuds and rose swirl structures, now add some detail. The petal work still needs to be done. You can add as many as you like. Don’t forget to add other parts of the Rose. You will need the stem and the sepals. Keep your lines rather short here when you’re creating rows of petals. Shade the lines and flowers by smearing the. Blow away all charcoal or other remnants. Try to avoid the dark areas. If you do manage to make this mistake, use the kneaded eraser for a quick fix. Now you a have accomplished lines, the rose, the bud and the leaves of your picture of a Rose. Follow the lines carefully. If you make a mistake and the erasers can’t eliminate it all, just shade over the area. Start getting some creativity going. You can add your own flare and work here. Use colored pencils to help you along. Use the Q-Tips to start blending some of the lines. Do the darkest shading at the bottom or the petals or between them. Leave the lines on the flower soft but darken the lines. Spray the work with Krylon workable matte fixative. You are now finished with the picture of your rose. You can make this picture in color as well. Use the Conte crayons if you want to try your hand at gold and yellow roses, brick red leaves and other exciting colors with the pastels. Try out the color patterns in the pastels before working. Copy the outline of the rose to utilize if for painting. Find books on One Step Painting that gives you options to complete projects that use different substances like acrylic paint. Whatever your next project is have fun. Keep trying to improve you skill and hone your abilities.